Last week, we hosted our first Tech Talk at RX2 HQ. Many came out to hear RX2’er, Jack Durham speak about AWS. Two hours, one awesome presentation, and few beers later, we all learned a few new technical terms (EC2, ELB, S3…) and some cloud computing tips. Thank you Jack, you did an amazon-ing job! RazorX2 will be hosting many more Tech Talks regarding topics that are relevant to our team. We would like to take it beyond our team and create a place where contractors can learn, share, and collaborate. If you have a topic you would like to present or see covered at a RX2 Tech Talk contact Mandy at alevri@razorx2.com. 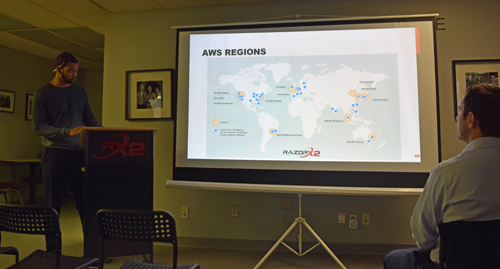 ← RazorX2 Tech Talk: An introduction to Amazon web services (AWS)!